Jayendra studied Chemistry but found his passion in advertising and begain his career in 1978. 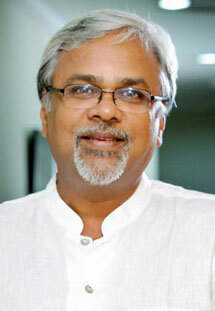 He turned creative consultant in 1985 and had the unique distinction of consulting with three top agencies in Chennai at the same time – HTA, Mudra and Sistas. In 1986, he teamed up with PC Sreeram to start JS Films, a firm that became the leading advertising film production company in Southern India. In 1993 Jayendra teamed up with Senthil Kumar to set up Real Image, introducing non linear editing with Avid and digital cinema sound with DTS. Jayendra has also conceptualized and directed India’s first Carnatic concert film ‘Margazhi Raagam’. He later directed a bilingual movie '180' in Tamil and Telugu and a unique musical concert called 'One' that featured the noted Carnatic singer TM Krishna. Jayendra is also associated with various social organizations and has created short films to bring awareness and funding to a variety of causes.